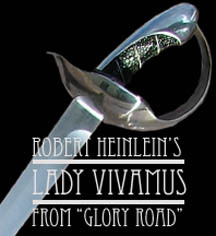 Authenticated and exacting re-creations of swords and armor made famous in film, television, literature and fantasy art. Film Swords is proud to bring you accurate, licensed and authenticated swords and armor from film, literature and fantasy art -- the stuff that fired your imagination and fueled your childhood dreams. Not just replicas or "look-alikes," but exact, definitive re-creations that are fully functional. We make them in limited editions of hundreds and thousands, not hundreds of thousands. By investing in one of our pieces, you are joining an elite world-wide group of discriminating collectors that demand the very best. Our pieces take longer and cost more to create - both in R&D and in production. As craftspeople and fans ourselves, we allow no compromises. Everything you see here is hand-made in the U.S.A., right here in our workshops. Wherever possible, the original artists that created the film pieces or artwork are actively involved (and receive royalties), and all cast fittings and specifications are taken from original props and molds. The one common thread throughout all of the testimonials we have received from our customers has been, "you have made my dream come true." That is what we strive for in everything we make. We love what we do -- and you will too. Now you can reserve any item on Layaway! We've now made it easier to reserve one of our limited edition swords before they run out. Go here for more information and set up a payment plan today! Gift Certificates -- perfect for any occasion! If you are uncertain which of our products would suit the person you have in mind, an Albion (good for Jody Samson or Film Swords merchandise as well) Gift Certificate could be the answer! Call 1-888-806-HELM (4356) or email Mike at Albion Customer Service. ... I have just received my Albion Arn Sword with a custom scabbard & belt made by Christian Fletcher. I am in a sound state characterized in awe. I have seen this sword in the movie, & I have also seen it online; but to actually see & hold it in person can only be described as motivational inspiration! This is a sword truly fit for a Templar Lord. Simply magnificent! The craftsmanship that is put into your creations is amazing. 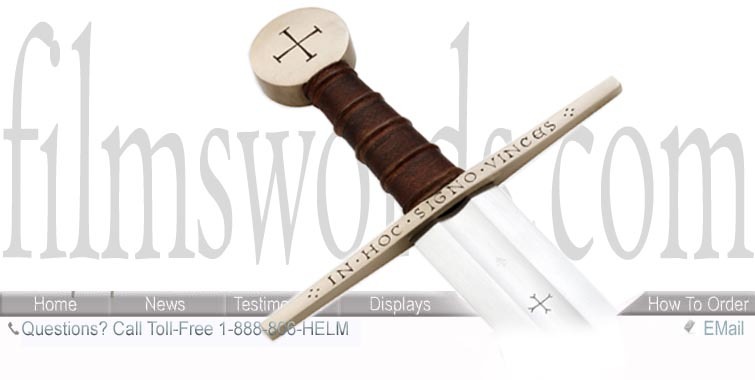 You guy's are connoisseur's, & make swords specifically for a connoisseur collector. The handling, the detail, the fit & finish, & the fact that all of your swords are fully functional; is superb! I have one more Albion sword in the works right now with Christian Fletcher for a custom project using the Knight Blade; when that one is done, there shall be another! Many blessings to eveyone over there, especially to Peter Johnsson for giving Mike & the Albion staff the idea's to recreate historical masterpieces. ...You must give my true best to Lars, and my profound thanks, Howy! That covered, Howy, you know that your dream, the dream that has become Albion itself, is one of the most important dreams in today's world. I'll tell you this, Howy, the honorable warrior in me owes no man more for my dream than I owe you - well, you and Mike Sigman, and your entire team of dream masters. 1. When Frank Frazetta painted it [Bloodstone], it was his dream, and he brought it to life on canvas. 3. My dream came true yesterday, and later today I'll post a couple of photo albums showing my dream sword's arrival and first use outside! So, I say again, dreams can come true. 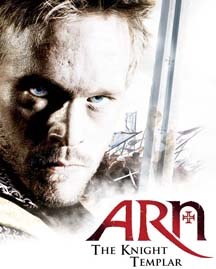 ...I received my Arn Sword yesterday. While I have numerous swords in my collection (Gen 2, Hanwei and Windless), this sword is by far the best sword that I have seen and wielded to date. The weight and balance is perfect. The workmanship is fantastic. I do understand that you get what you pay for, but this really exceeded my expectations. I’ll be looking at Albion Swords more closely in the future. ... I just received the father's sword.. Awesome. It's beyond cool... It's super cool. Thank everybody for me. It will take it's place along side the Atlantean and the Martian longsword, oh how sweet it is. When the funds are ready I will be placing an order for the Discerner! If for any reason you guys stop making those or taking orders for them etc let me know or throw my order in for me,hahaha! I'm going to get it eventually, just want to make sure it doesn't disappear on me before I have the chance. Thanks again for everything. I just want to applaud you and your crew for the fine craftsmanship you have so painstakingly put into these blades. This is an amazing sight to behold. You have taken my childhood dreams and turned it into reality. I was in such awe when I first opened that box. It's really nice to know that I have one of the last few pieces that were in production. This has become my greatest treasure (next to my bible and faith). Thank you so much again for bringing so much joy into my life. It was well worth the wait. ...Just wanted to drop you a note that I got the Frazetta John Carter Warlord of Mars Longsword as realized by Mr. Samson. It's a real beauty. It handles in the hand fantastic. I have to be cautious with this sword in particular because it's actually quite long and super sharp. The gentle upswept curve moves the point around much more than I would have expected also. Definitely a finesse weapon. This sword is calling out for either a nice scabbard and "jewel-encrusted" harness system or a nice presentation display stand. It really is quite impressive. Imagining John Carter using this weapon or defending Dejah Thoris is satisfying on so many levels I can't even tell you. Thanks and kudos to all of you that made this possible! ...Holy God Mike! You said this sword was great, but I wasn't expecting this. I got the Martian Longsword yesterday, and I have to tell you, I'm impressed, greatly. The blade is a few inches longer than a European longsword I have, but the weight is mainly in the hand, and not in the blade. I was a little leery about buying a sword that's so expensive, but I am very glad I did. Albion and Jody Samson have earned my gratitude, and any extra, hard-earned cash I may have on hand... Thanks a million to you also, Mike. Were it not for your earnesty and dedication, I doubt Albion would be where it's at today. My thanks go out to everyone who worked on my sword, and any one else’s sword who forgot to put in a thank you, you make childhood dreams, and even adult dreams for that matter, a reality while letting us keep our homes. Have a great day, week, or what have you, and keep up the amazing work! 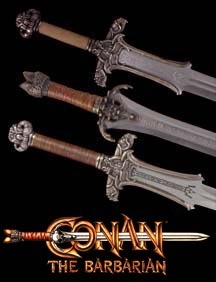 ...Hi Just got my Conan Atlantean sword today. Outstanding, My heart swelled with joy on opening the wooden box WOW!!!! What a, Astonishingly Beautiful Magnificent piece, it truly is a Work of Art. Then to actually pick it up and hold it, WOO!!!! Boy is she heavy, I wasn’t expecting that, Fantastic. My forearms are really humming after swinging it about or a while. The more I handle her, the more I love it, and it just doesn’t get any better than this. Well apart from getting married and having your first child. But it’s up there. I cannot praise you guys enough, THANK YOU so very much for making the dream come true, for me and so many other people. May the road rise up to meet you. May the wind be always at your back. May the sun shine warm upon your face. May your beard grow long and have many hamsters. And may you be in heaven an hour before the Devil knows your there. I am so proud to be the owner of one of these fabulous swords. thanks to everyone involved. 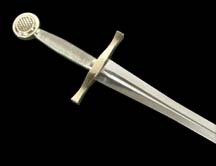 The Vic Anselmo sword: Beautiful. Sleek. Deadly. There is something about this sword that speaks "perfection" Every element of the sword is in harmony with the others. The blade shape is gorgeous -- the gentle sweep of the long blade melds perfectly into the pseudo-scimitar end with it's additional false edging. It WANTS to be swung. The craftsmanship is excellent. The lines are clean, the fit is tight, and the walnut grip is sumptuous. In a word, "perfection." Perhaps as others have said you just have to hold one in your hands to truly realize it. I have owned, and will own, other more ornate swords, with more exotic materials. In fact, I am awaiting an Atlantean right now. Yet, I think this sword will always be one of my true favorites. ...We picked up the Father's Sword and I was floored by the packaging, and upon opening the packaging, I was stunned by the quality and workmanship of the sword. I never expected it to be soooo good. It is just like the image on the website, and after a less than satisfactory previous experience [with another company], believe me, it was such a relief to view such a magnificent piece of art. A superlative piece of work. Thank you everyone at Albion Armorers. Please note: Film Swords recreations are NOT intended for use as a weapon. 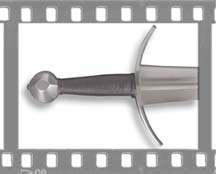 Any such use voids all warranties and no liability of any kind for such use can be assumed by Film Swords, LLC or its licensors. Website design copyright © 2003 by Albion Armorers, Inc.